This site has been selected as a valuable educational Internet resource for Discovery Channel School. s time has passed and Your Humble Author has grown (both physically "in the round" and, hopefully, also as a historian and writer :-), he has experienced a broadening of both his skills and interests. These changes, we hope, will bring an added benefit to our Honourable Readership, consisting primarily of middle and high school students and their teachers. Also, we do not want to forget our other faithful friends -- the coin collectors, reenactors, college students and people of the academic community. Though we dearly love the fine figure cut by the emperor Probus on horseback that appeared on the previous version of this home page, Your Humble Author has decided to update this graphic to draw attention to the other changes that are brewing on this site. In years past, we drew on the wealth of visual communication provided by the Romans themselves by utilizing coins to illustrate the ideas and concepts presented in our articles. This decision was due in part to our unwillingness to use images scanned from art books, auction catalogs, and other copyrighted sources. Recently, due to the help of several wonderful, sharing people, we have been able to obtain beautiful original photos taken at the very place of many historic events talked about here on this site! Please see the section of this page under the title Winds of Change. We have kept here on this site every coin image and mini - article we have written in the past, and will try to augment and correct these as we find occasion to do so. Please see the links to selected special interest areas on our old home page. We have at once broadened our focus and introduced a little long-overdue diversity of opinion on this site by enlisting other willing hands to donate their time and expertise to share in the authoring and illustrating of articles that appear here. Some of these individuals have expressed a desire to contribute actively to the site. Others have given kind permission to use photographs taken on numerous trips to classical sites in Europe and the British Isles. It will be an ongoing policy on this site to seek to shift ownership of this resource from the control of one individual to management by a team of dedicated volunteers. In pursuit of this goal we will continue to try to recruit more outside help. We have added a page in which we introduce to you, our readers, these fellow collaborators in this ongoing labour of love. The interesting projects that these people have undertaken and the contributions they are making to this body of knowledge in ways both large and small make for some fascinating reading. Please check this link often to see changes in this area. At the right is an image of a Roman centurio (often called a centurion in Modern English) training the new recruits of one of Rome's many legions in the gladius pit. It was discipline and drill that made the Roman legions a far superior fighting force to any army that another nation or kingdom could put into the field. The young recruit, not visible here but who is actually standing to the left of the centurio, is being required to wield a GLADIVS (Roman short sword of Spanish origin) and CLIPEVS (small round shield) of twice the regulation weight as the training officer tries to get under his guard with a blunt but forcefully delivered stick. How did we get such a good color photograph of a two thousand year old warrior, you may ask. Well, your Humble Web Author has shared many a glass of watered vinegar with this man. We both serve in the Tenth Roman Legion, only recently mustered once again after about 1700 years! The Latin name for our unit is LEGIO X FRETENSIS, Fourth Cohort, and our standards proudly carry our legion's name in its abbreviated form, LEGIO X FRET COH IV. For these are modern - day reenactors, those practitioners of living history. In keeping with Your Humble Author's committment to the sixth and seventh graders of this world, he has gone and joined up, to, as the old song says to "'enlist, Bonnie Laddie, and come awagh!" In his enthusiasm to present as accurate, lifelike, and interesting a picture of Roman history to his esteemed readership, he has committed himself to hauling his aged and corpulent carcass over hill and dale, wearing the regulation HAMATA, the thirty to forty pounds of Roman chain mail. He carries the PILVM, and wields the GLADIVS as well as an old veteran of many wounds can. We can relate happily that the kids, their parents, and their teachers love it when we show up at a public event! We have added an entire new area of images. 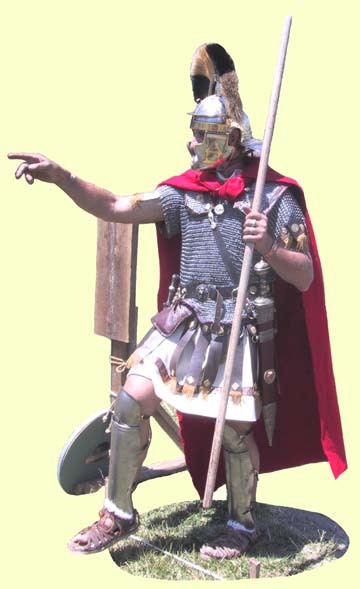 Many of the images are of Roman reenactors and reenactors of other periods. The complete gallery of images of Roman reenactors in the author's collection good as well as some not so good that are kept because they help to illustrate a concept or object, can be seen at the LEGIO X FRETENSIS Virtual Photo Album and Scrapbook.